As an avid book reader I enjoy sharing of our book finds with you. 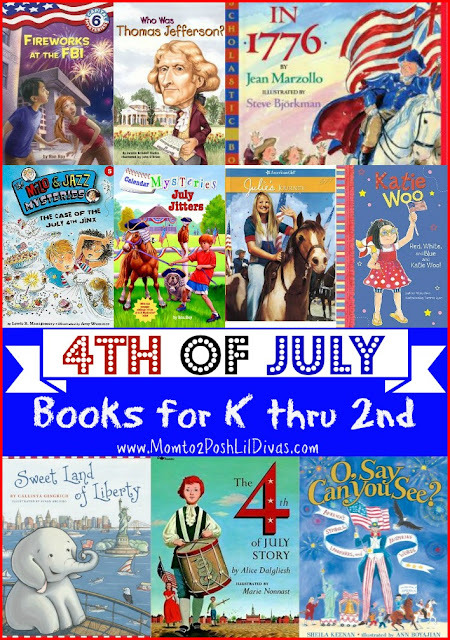 With Independence Day nearing I thought it would be the perfect time to share some of our favorite 4th of July themed reads (that we've been enjoying over the past two years) for your Kindergarten thru 2nd grade readers. If you enjoy this list be sure to check out our Favorite Chapter Book series for K thru 2nd Grade too. The 4th of July Story - This story makes the American Revolution come to life for children. It's a great starter book for children interested in the "why" of the holiday like the Lil Divas were. They learned a bit about the British, the settlers, the colonies and the great men of that time who impacted our future - George Washington, Patrick Henry, Thomas Jefferson, John Hancock, Benjamin Franklin and John Adams. It was a wonderful way to explain our history in a way children can digest and spark an interest in the past that so importantly shaped our future. The Milo & Jazz Mysteries: Case of the 4th of July Jinx - The Milo & Jazz books are a fun detective series for early chapter books readers that we recently found. With the 4th of July just around the corner I decided to pick up this one to get a taste for the series. The story does not explain or teach about the 4th of July, it's set during a 4th of July Fair where a series of weird events take place that make people people it's jinxed. Milo & Jazz have to uncover the mystery. The Oldest Diva enjoys mysteries so she was instantly drawn in by the book plot and characters. We enjoyed reading it and trying to uncover the mystery along with Milo & Jazz. It's a great fiction book set around the 4th of July for fun reading during the holiday. Calendar Mysteries: July Jitters - The Calendar Mysteries are by the author of the A to Z Mysteries series and feature their younger siblings. These books are shorter and easier to read and the Oldest Diva has been enjoying them as we read them month by month. In this story, there is an Independence Day pet costume contest and the winner gets to be Mayor for a day. It's an easy read and a great early chapter book series for kids in 1st - 2nd grade. Red, White and Blue and Katie Woo! - Katie Woo is a 6yr old Asian-American girl and a fun character for early readers. The Littlest Diva enjoys this series and she is able to read them well. The books are short (this one is 32 pages) and have color illustrations which are engaging. In this 4th of July themed story Katie and her friends celebrate the holiday with a parade and lots of red, white & blue fun. Capital Mysteries: Fireworks at the FBI - The Oldest Diva is enthralled by all things relating to Washington, D.C so she has really gotten into this series (it's another series by the author of the A to Z Mysteries but so far she prefers this series way better!) This is a great mystery series for early chapter book readers which is why it's such a hit in our home. In this particular book KC and Marshall see fireworks shooting off the FBI building that aren't part of the holiday festivities. Of course they are suspicious and have to find out what is really going on. We love that these books are like a walk through D.C with all the mentions of the buildings and monuments. They never disappoint. American Girls Collection: Julie's Journey - The Lil Divas are into American Girls - BIG time! The books are still a bit much for the Oldest Diva but they are perfect read-alouds for us all to enjoy together. One of my favorite dolls is Julie so when I was given a few of her books I was excited to share them with the Lil Divas. This one is about Julie being part of a wagon train in honor of America's Bicentennial. She is excited about experiencing pioneer life but when she falls off her cousins horse, she's faced with fear about continuing and getting back on. I really like that Julie's character does not give up. She even ends up being a sort of hero when she uncovers an important document. I love the historical context of the book. Who Was Thomas Jefferson? - The Oldest Diva just got into these non-fiction books. The huge bobble head type illustrations on the cover may or may not have been the cause of her cracking the first book open. In this book we find out lots about one of our founding fathers, our 3rd president and the writer of the Declaration of Independence. O, Say Can You See? - This book offers explanations for the patriotic symbols we see everywhere, especially for the 4th of July. It also touches on important landmarks and our history through all the symbols in a way that was perfect for my 6 and 7 year old. I actually used this book in my 3rd grade classroom years ago as part of our Social Studies unit on US symbols which is how I came to share this gem with the Lil Divas as one of our read-alouds at home. Sweet Land of Liberty (Ellis the Elephant) - I read this book with the Lil Divas last year as they were drawn by the sweet elephant (Ellis) on the cover when we came upon it in the library. The book didn't disappoint. We follow Ellis as he goes to the library to learn more about America's history. The book digs into our history in a way that is both engaging and packed full of information for kids. The Lil Divas learned a lot and it sparked them to want to know more. The book is a historical fiction and it provides some great information in a way that children will enjoy following along with. In 1776 - This book tells the story of the American Revolution in fun rhyming and fact-filled verse. It's a quick read picture book that gives a glimpse into how & why we celebrate Independence Day. Do you have any 4th of July themed reads to share for kids in K thru 2nd grade? Please share them with me (and our readers) in the comments below. I'm always looking to add great titles to our reading list. For more books and reading posts be sure to check out our Reading Corner and our Reading (For Kids) Pinterest board. Perfect timing! Thanks for sharing! Awesome list! Of course, I had to go and purchase a bunch of these :) We love your blog. Keep up the great work! This is a great list! I'm so glad you found it. I'd love for you to share this with my Cozy Book Hop (it opens again on Thursday) - I know it would be a big hit. Linking to this on my biz page on Facebook; love it! Thank you!! Feel free to "fan" it. I'd be honored.